Point Pleasant junior Josh Wamsley follows a block by teammate Justin Brumfield (10) during the second half of a Week 8 football game against Meigs in Point Pleasant, W.Va.
A shutout, a shocker and a bit of bad luck. That was the story throughout Mason County on Friday night during a trio of Week 9 football contests. 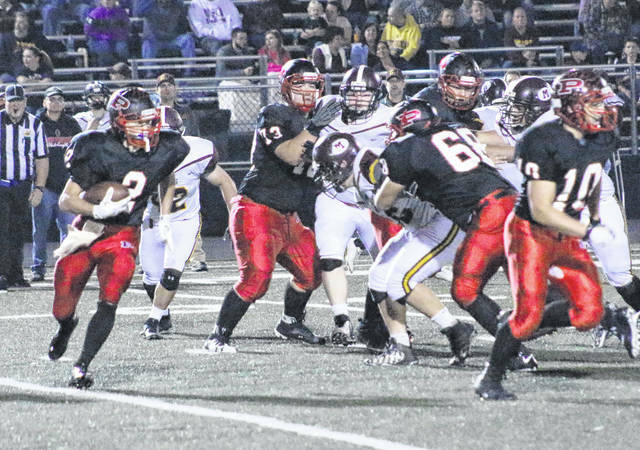 Point Pleasant (7-2) blanked Man (1-7) for the second consecutive season after posting a 45-0 victory over the Hillbillies at Ohio Valley Bank Track and Field. It was the first shutout by the PPHS defense since Week 9 of last fall when the Red and Black scored a 41-0 win at Man. Wahama (4-5) improved to 7-1 all-time against Miller (6-3) while putting together its third consecutive victory on Friday night during a 14-7 victory at Bachtel Stadium. The White Falcons hadn’t won three straight decisions since the 2014 campaign. Hannan (2-6) fell to host Gilmer County (2-6) by a 46-6 margin on Friday night in its Week 9 matchup. Point Pleasant completes its regular season schedule next Friday when it hosts Westside in a Week 10 clash at 7:30 p.m.
Wahama has Week 10 bye and returns to action on Friday, Nov. 3, when it travels to Buffalo for a 7:30 p.m. kickoff. Hannan will complete its road schedule next Friday when it travels to Phelps for a Week 10 bout in the Bluegrass State. Due to an early deadline, the Mason County gridiron games from Week 9 will be available in full detail in the Tuesday sports edition of the Point Pleasant Register. Game stories will be available online at mydailyregister.com before appearing in print.